Amber has picked out a wide variety of fabrics and items she'd like to have. I've pictured most of the fabrics she chose and I'll list the items she is looking to get. 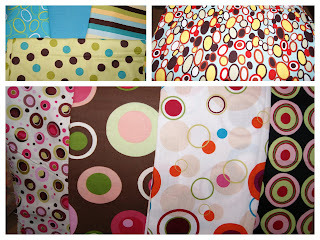 This is a few fabrics she chose for blankets. She said that she really only had a few and would like a few more. 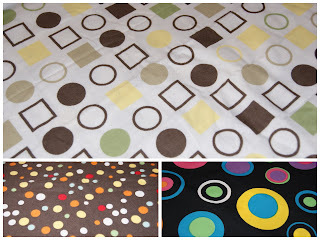 She has chose the black bright colored print for a taggie blanket for Ealyn, the white one just like it is with her name or intials on it and the brown one she wants with a red on the other side. This black and white print and the pink with white swirls fabric is what Amber has chosen for her nursing cover. Nursing Covers at $18.50. If you'd like to purchase something from Amber's registry you can contact me at maddiemoosboutique07@yahoo.com or at 615-443-1265. I've started doing some cute little outfits using the ruffle bottom pants. Here is one I did for Maddie for Valentine's Day. I used a pair of her jeans that had become too short, but still fit. I added a valentine print ruffle. I paired the jeans with a cute pillowcase dress for a shirt in the same print. This outfit can be worn as you see OR you can put the pillowcase dress on with some tights or leggings and make a totally different outfit. Same goes with the pants, you could easily just put a solid shirt on with them and wear the jeans without the pillowcase top. It is one outfit with several different wants to wear it. Another option is to use a jumper dress style top with the ruffle bottom pants. Below I did a red jumper top which has a solid red on one side and a red and white polka dot on the other. Making it reversible gives it more use as well. I put it on with a black and white polka dot pant with red ruffle and created another option to wear for Valentine's day, but not limited to just that. If you'd like to order an outfit or have any questions, please contact me at maddiemoosboutique07@yahoo.com or 615-443-1265 and I'd be happy to assist you. I'm currently doing a cute pair of St. Patty's Day pants. I'm now making micro preemie and preemie bibs!! They are so small, but adorable. I have a friend with a micro preemie little boy and I wanted him to have bibs that fit. This one pictured is a micro preemie bib that I made for him.. They are $5 each and I can do them in any color or pattern you'd like. I can also monogram them for an additional charge. Here is a pair of Ruffle Bottom Pants that I just learned to make. These will be custom orders only. If you are interested in getting a pair for your little girl, just give me a call at 615-443-1265 or email me maddiemoosboutique07@yahoo.com. Tiffany has been so busy with trying to visit with Cooper as much as she can, we're a little behind on doing her registry. She told me today that she wants bibs, burp cloths and passy clips in any chocolate and teal/aqua or any light shades of green. Kevin also loves Titans, so anything with that on it, he'd love. If you wish to purchase something for her, please let me know and we'll figure out a great gift.